Clear, thorough, and accurate communication is paramount among all parties in legal proceedings. Integrity Interpreting provides interpreters in a variety of legal settings including, but not limited to, lawyer consultations, court proceedings, real-estate closings and negotiations, social security hearings, appeals, depositions and any scenario where documents are signed or formal decisions are made. Mental health scenarios such as assessments, evaluations, diagnosis, and treatments require critically accurate communication. When more than one language is involved, mental health professions and those under their care are presented with additional challenges where communication is especially pivotal when the involved individuals are deaf and uses sign language. The professionals of Integrity Interpreting ease these challenges for effective and proper mental health services. Similarly to Mental Health interpreting, accuracy is of the utmost importance. Hospital procedures, consultations, or simple doctor’s appointments require the interpreting services of Integrity Interpreting professionals to navigate communication obstacles between medical personnel and deaf or hard of hearing patients, including caretakers of a deaf or hard of hearing parent, child, or adult. 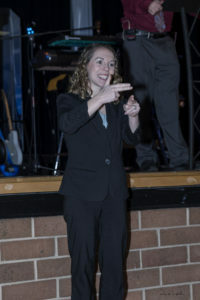 All educational theaters require clear translation between deaf or hard of hearing students and teaching professionals. Integrity Interpreting eliminates educational challenges between students and teachers, service providers, and classroom peers at any level including primary, secondary, college and university, and graduate or higher educational environments. The reverence of religious interpreting requires a certain tact and attention to detail. Integrity Interpreting professionals navigate all religious settings including services, religious education, workshops, retreats and camps, conferences, confession, scripture study, counseling, pilgrimages, weddings, funerals, and other special ceremonies and events. Oral transliteration, also known as oral interpretation, is used to aid in communication between Deaf or hard of hearing individuals. Oral transliterators use speech and speechreading as conveyance between the communicating individuals. Integrity Interpreting professionals silently mouth sentences to the deaf or hard of hearing person, and will smartly adjust words or phrases to those that are more easily speechread. Oral transliterators may also use voice for speakers who use none, or for those whose voices are otherwise difficult for listeners to comprehend. For complex tasks or those exceeding two hours, it is the policy of Integrity Interpreting to assign two hearing interpreters to work in tandem for the duration of the assignment. Communication Access Realtime Translation, or CART, is a realtime captioning service which utilizes text-to-speech interpreting for anyone in need of communication access. The beneficiaries may include those who have experienced hearing loss, those deafened or deaf, and those with specific language or learning needs. Anyone who can read can benefit from CART, including those with hearing aids, implants, and loops. In addition to the freedom, confidence, and full participation which comes with CART, the service can serve any large audience or any situation where records of proceedings are necessary.